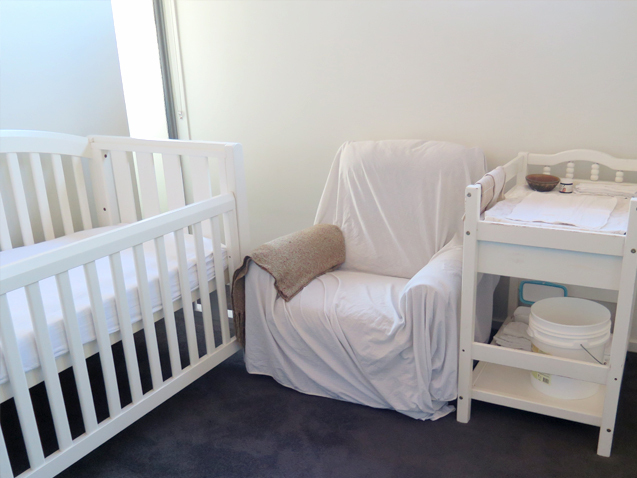 Today, I thought i'd tour our baby's bedroom. Truth is, the whole house is his bedroom, happily falling asleep anywhere. Please don't assume he's a perfect sleeper. During the day he has cat napping down to a fine art, and midnight through to dawn, I'm up every two hours. Luckily, I get one solid four hour block from him in the evening...at the moment. I say at the moment, because last month the four hour block of sleep started around three in the afternoon. Anyway, I'm not here to talk about his sleep patterns. 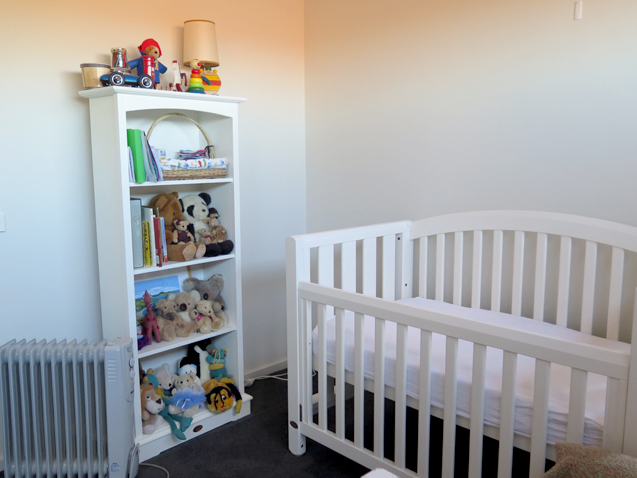 I'm here to explore the baby room with you, sharing how and where we sourced everything. Before you begin scrolling, I want to put out a disclaimer about the tidiness of his room. The space rarely looks this ordered. Maybe once a fortnight I'll clean it, fold clothes, put items away. This was one of those rare events. Borrowing, sharing and choosing secondhand are three easy to action steps of the zero waste lifestyle and will help anyone avoid needing to buy new plastic too. It's easy to source most items for a baby this way. Why? Because baby stuff is not bought for long term use. Babies grow fast and their needs change month to month. Had we not lived this lifestyle, I would have made the choice to 'shop' for our baby room by borrowing, sharing and choosing secondhand. It makes financial sense to borrow, share and shop secondhand for items that will only be used for a short period of time. 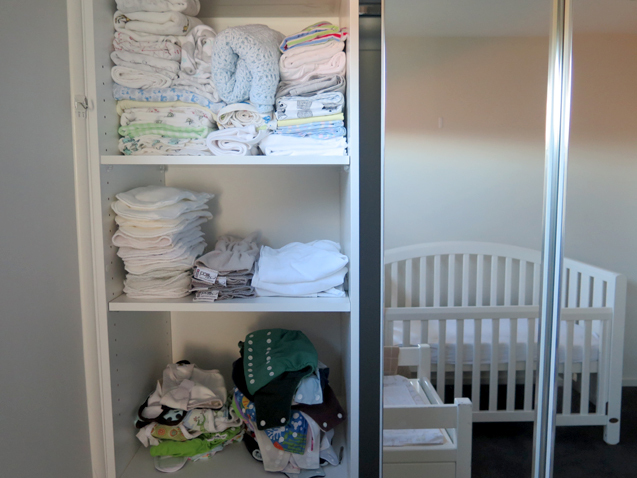 Thousands of parents seem to agree, and that's why secondhand baby items are abundant. The world truly does not need more new baby things made. It was not hard to find all we needed. The moment I alerted the world to my pregnancy, there was a flux of communication from parents happy to pass on, lend and sell their used baby goods without me even having to ask. What was not borrowed or shared, was found on Facebook Buy Swap Sell, Ebay and Gumtree. Out of all three, I'd say Facebook Buy Swap Sell groups to be the most efficient place to gather baby goods. There were niche groups for most items on Facebook. I found sellers provided more information, were easier to communicate with, offering more room to negotiate a fair price. Op Shops were the hardest place to find anything other than clothes, blankets and toys. 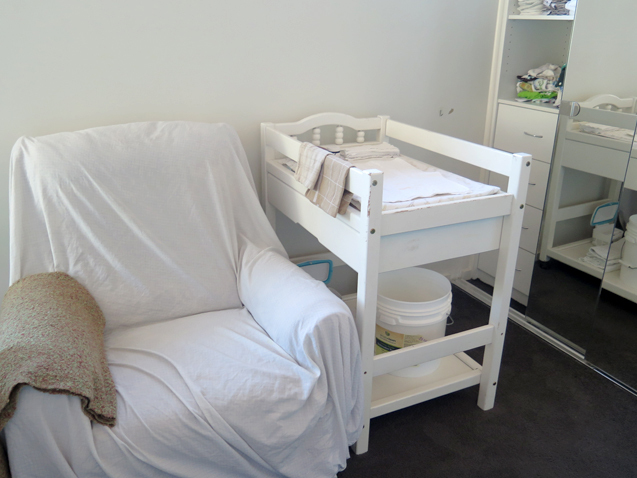 The cot and bookcase were bought from our local Facebook Buy Swap Sell. He's not sleeping in the cot full time, yet. 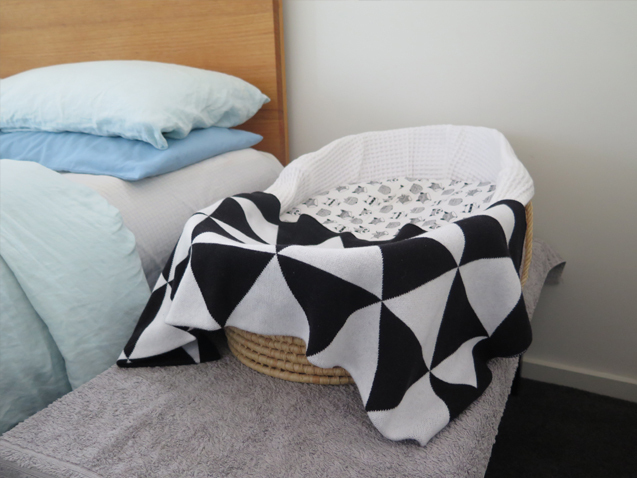 The day time naps and evening sleep are in the cot. For the rest of the night, he's in this bassinet next to our bed. My siblings and I, all slept in this bassinet as babies. 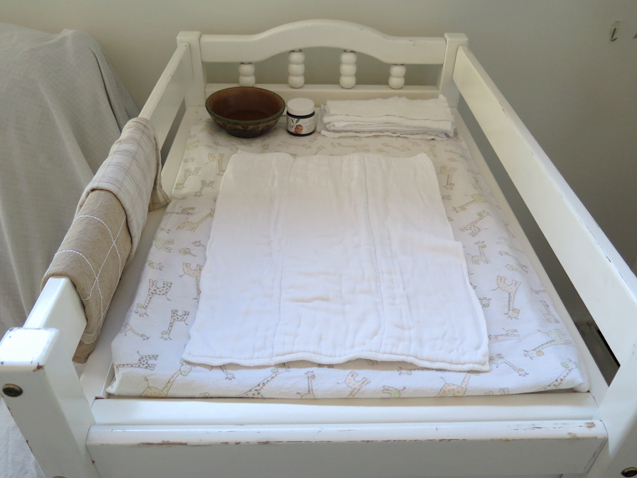 I'm in negotiations on when the cot will come into the bedroom...I get this strong feeling the Builder is hoping the cot will relocate to the spare room with me. I don't know if it's because of the baby waking him up or my snoring. 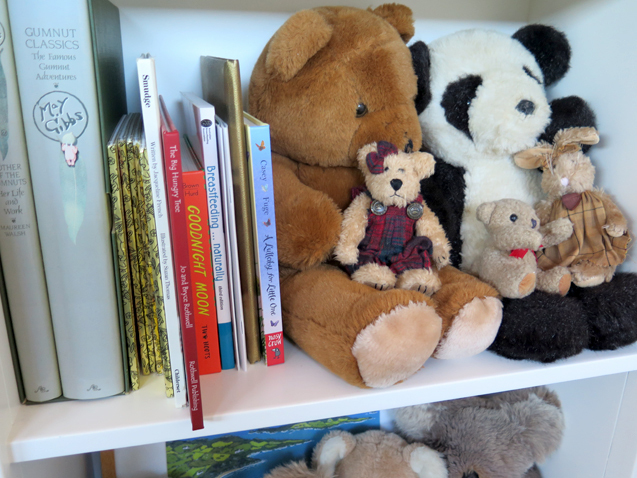 Some of my old teddy bears, lined up waiting to be played with, sit upon the bookshelf. Old books, sitting alongside new books. 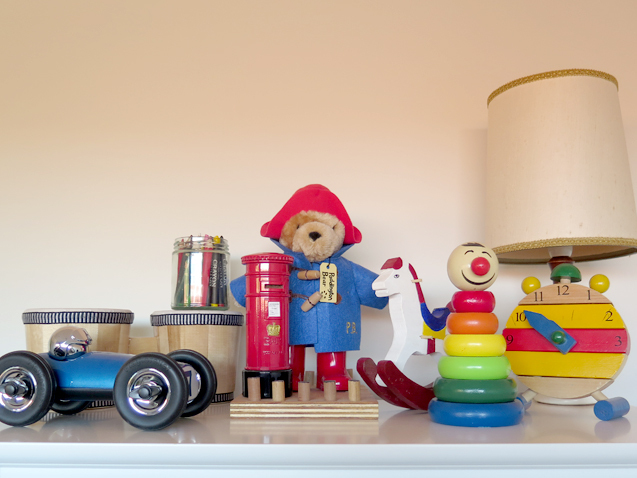 A mix of old and new toys, plus a secondhand lamp. I chose not to style the room. Since most of what makes up the room would be passed on eventually, I didn't see the point. Having said that, if creating a special theme is something you'd love to do, it can be achieved just as easily buying secondhand. The chair was bought in haste, by my mum and sister from the local secondhand charity store. I had not planned on having a breastfeeding chair. But it was the best $25 spent and i'm glad they talked me into it. It's in really great condition too. We think the chair spent a majority of it's life wrapped in a plastic cover, reserved for special visitors only. I keep meaning to have a closer look at the chair for money hidden inside. You hear these stories of buyers finding cash in old furniture. You never know! Until then, an old bed sheet will stay draped on top, catching any vomit/spit from bub. Our change table came from one of my readers. Hi Lori! She had no need of it, so passed it on. 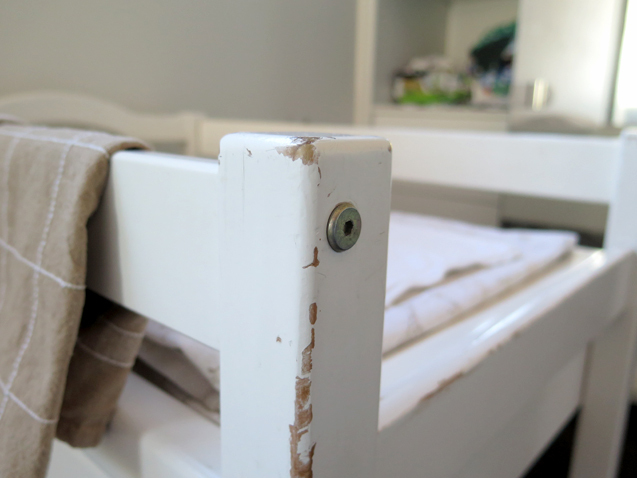 Like the bookcase and cot, there were marks on it. They are used items. The chances of wear on secondhand items is a high possibility. That's something to get comfortable with if new to buying goods secondhand. The Builder offered to paint it, and i'm still waiting. Sheets, wraps, muslins, clothes, shoes, socks, bibs, blankets were all donated by family and friends. Nappies sourced from a Facebook group and Gumtree. Baby carrier (behind the door) found for a bargain on Gumtree. We bought a bundle of towels from the same local secondhand charity for nappy free time. Ask for the serial number or product name to check safety standards and product recalls at www.productsafety.gov.au before buying or borrowing furniture, prams and car seats. Don't be afraid to ask ALOT questions about the items before committing. If you can, view the item first before purchasing. I'd advise this for furniture, prams, highchair, change tables, to make sure they are sturdy and stable. Look for missing or broken parts. Buddy up with a friend or family member when going to view or pick up items from strangers, just to be safe. I would suggest asking family and friends that are offering to pass on free stuff, to detail what they are intending to give. It might be free, but make sure it's useful too. Look out for second hand baby markets or swap parties in your area. When it comes to rehoming the items, they will either be sold or given back to the person we borrowed it from. 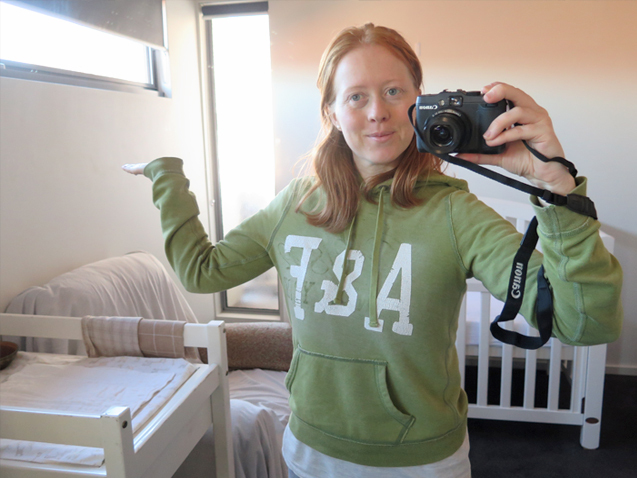 Another option is donating to charity organisations like St. Kilda Mums. They take items for families suffering hardship. If you would like to find something similar, contact the local council, ask a maternal health nurse or child health services in your area. And here is the newish Mum. Dressed in pyjamas. Needing a shower. Thanks for letting me show off the baby room. Enjoy your weekend.